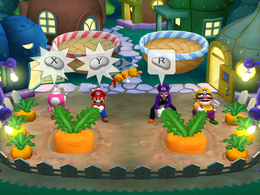 Garden Grab is a 2-vs.-2 minigame in Mario Party 6. The changes between daytime and nighttime are only aesthetic. This minigame appears in the Miracle Book, on the page "Bountiful Harvest." Both teams are grabbing on to the stems of a giant carrot. They then slightly pull it out of the ground. The teams have to work together to pull up a giant carrot out from the dirt. 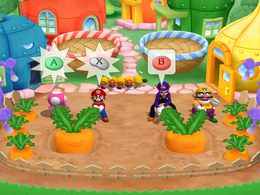 To pull the carrot out, both players in the team must press the button shown one after another, then rapidly press the button shown until the carrot is uprooted. The team that pulls their carrot out of the ground first wins. The winner's carrot flies out of the ground and into their basket as they fall backward in shock. They then perform their winning animations in front of the basket. Rules – "Team up with a partner to uproot a giant carrot! Press the displayed button to pull. The team to uproot its carrot first wins!" Advice – "Players in a team will have to alternate pressing buttons before ending by pressing the same button repeatedly." This page was last edited on January 18, 2018, at 11:09.